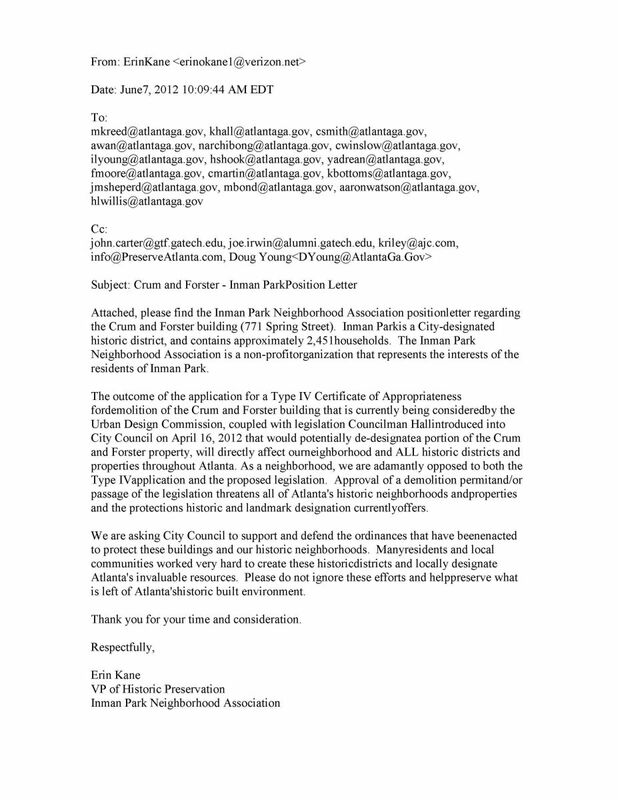 Below a copys of and links to public comment on the threat to Crum & Forster and Atlanta's Preservation Ordinance. Crum & Forster Fact Could Come Next Week by Hunt Archibald, Midtown Patch, January 5, 2013. 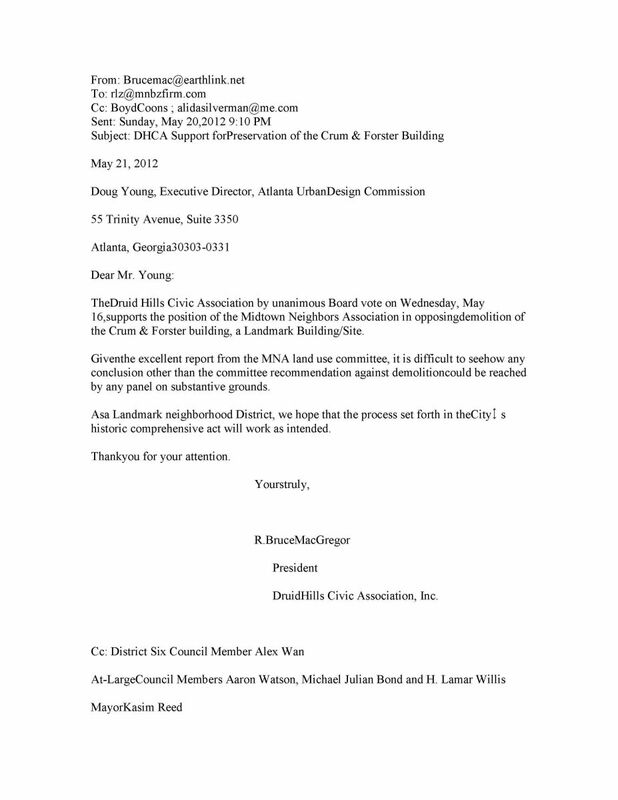 BZA declines to issue permit, temporarily saving historic Crum & Forster building by Mac Blau, Creative Loafing, November 2, 2012. 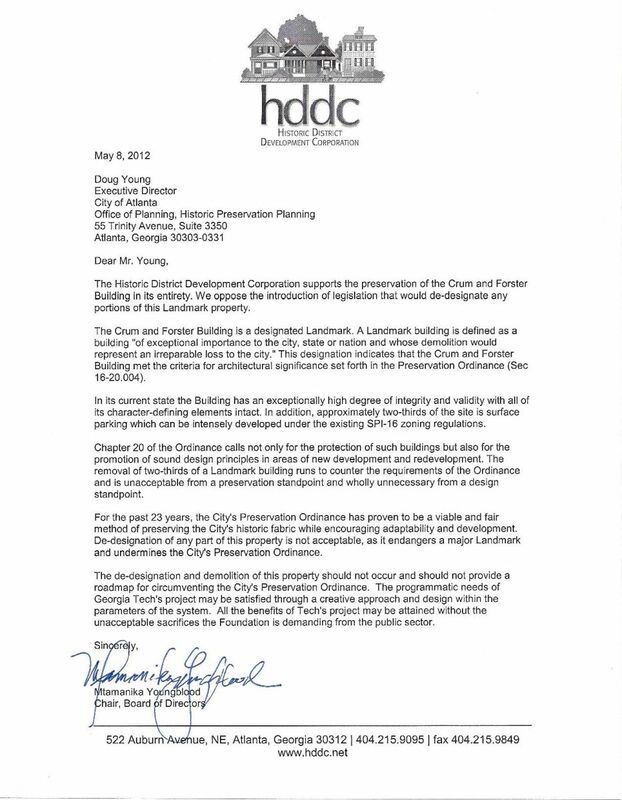 Maria Saporta's May 10, 2012 post on the SaportaReport, "Crum & Forster — the fight to save the entire historic building continues"
Hunt Archbold's Midtown Patch post of April 23, 2012, "Landmark Midtown Building Facing Possible Wrecking Ball"
TJ Kaplan's post in the Technique, Friday, February 25, 2011, "Fate of Crum & Forster to be determined"
Thorton Kenedy's Northside Neighbor column for May 23, 2012, "Column: Historic Rhodes Hall serves as a inspiration"
GA Tech Foundation 771 Spring Crum & Forster Code Violations on YouTube described as "documentation of building code and zoning code violaions at the recently purchased Crum & Forster building, which they want to demolish and replace with an empty grass lot"